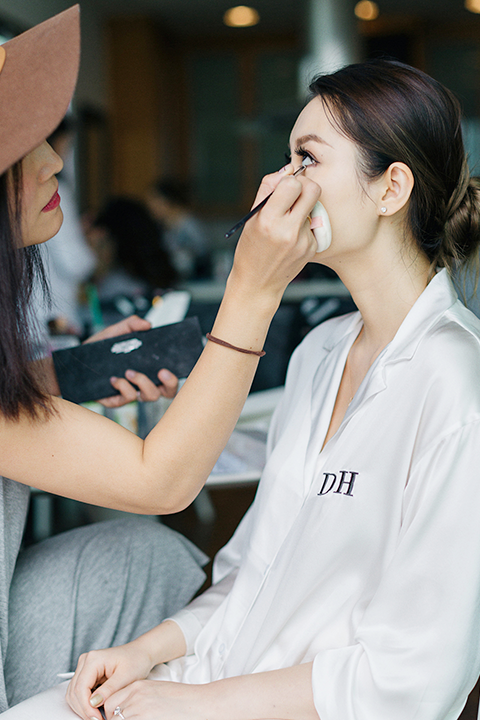 With her keen eye for precision and detail, Kelly Zhang has become one of the most in-demand bridal makeup artists and hair stylists in Southern California. My makeup line was inspired directly by the thousands of brides and women who I have served over the years. My clients told me repeatedly that they wanted to look beautiful, natural, and flawless on their big day. I wanted to enable them to feel that way every day. It pained me to hear their stories about overspending on products that were ineffective and sometimes even damaging to their skin. After months of research and testing (never on animals, but sometimes on myself! ), Kelly Zhang Cosmetics was born. Each and every product is packed with minerals, vitamins and antioxidants that care for your skin as it delivers superior, long lasting color and pigmentation. My cosmetics line is designed to help you feel naturally beautiful not only on your wedding day, but every day thereafter. It is both affordable and accessible, without sacrificing quality. I look forward to hearing your thoughts about Kelly Zhang Cosmetics. I know that once you try the phenomenal products in this line, you will be as excited about its launch as I am. Kelly Zhang Studio began as a humble dream and has since transformed into an industry leader for bridal hair and makeup. Kelly began the business in 2007, out of her own home, with just herself and one other artist. Her studio has since blossomed into impressive team of 10-15 devoted artists with a sister company, Studio K Hair Designory, devoted to blowouts, cuts, and color. Our team of passionate artists are dedicated to creating a unique and unforgettable look for each client. With their own personal makeup styles and tastes, we try to match each artists’ skills to our clients’ wants and needs. Kelly and her team are renowned for their hard work and talent in ensuring that each client leaves the studio feeling absolutely gorgeous and, most importantly, like themselves. This is why many of our clients continue to entrust life’s special occasions to our team of artists. Each of our artists uses the highest quality of professional products and tools, with a clear understanding of the best application for each skin type and skin tone. With backgrounds in film, television, and photography, each of our artists has undergone vigorous training in makeup principles, application, and technique; as well as hair styling artistry. Most importantly, every member of our team is committed to furthering their skills and keeping informed of the latest beauty trends through regular workshops with beauty industry experts.